Welcome to this open forum web-site . TME has all sorts of information on marine ecology and biology from around the world. While the emphasis is on tropical marine systems occasionally news and discussions from temperate waters will appear. I welcome all comments and or criticism about anything on this site and encourage you to send me any information about marine ecosystems that you find interesting. 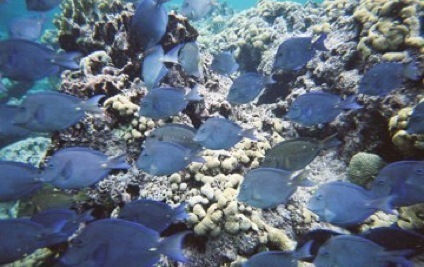 Marauding surgeonfish (Acanthuridae spp.) forage on the Belize barrier reef.